The aggregate market value of the registrant’s common stock, par value $0.01 per share, held by non-affiliates of the registrant, based upon the closing price of $2.55 on November 30, 2017, as reported on the NASDAQ Capital Market, was $48,946,434. For purposes of this disclosure, shares of common stock held by persons who hold more than 5% of the outstanding shares of common stock (other than such persons of whom the Registrant became aware only through the filing of a Schedule 13G filed with the Securities and Exchange Commission) and shares held by officers and directors of the Registrant have been excluded because such persons may be deemed to be affiliates. This determination of affiliate status is not necessarily conclusive for other purposes. The number of shares of registrant’s common stock, par value $0.01 per share, outstanding at July 31, 2018 was 22,220,019. This Annual Report on Form 10-K contains forward-looking statements within the meaning of the Section 27A of the Securities Act of 1933, as amended (the Securities Act), and Section 21E of the Securities Exchange Act of 1934, as amended (the Exchange Act). All statements contained in this Annual Report on Form 10-K other than statements of historical fact, including statements regarding our future results of operations and financial position, our business strategy and plans, and our objectives for future operations, are forward-looking statements. The words “believe,” “may,” “will,” “estimate,” “continue,” “anticipate,” “plan,” “intend,” “expect,” “could,” “target,” “project,” “should,” “predict,” “potential,” “would,” “seek” and similar expressions and the negative of those expressions are intended to identify forward-looking statements. These forward-looking statements are subject to a number of risks, uncertainties and assumptions that are difficult to predict. Therefore, actual results may differ materially and adversely from those expressed in any forward-looking statements. These risks include but are not limited to those factors identified in “Risk Factors” beginning on page 9 of this Annual Report on Form 10-K, those factors that we may from time to time identify in our periodic filings with the Securities and Exchange Commission, as well as other factors beyond our control. We undertake no obligation to revise or update publicly any forward-looking statements for any reason. Unless the context requires otherwise, references in this Form 10-K to “Aehr Test,” the “Company,” “we,” “us” and “our” refer to Aehr Test Systems. Aehr Test was incorporated in the state of California on May 25, 1977. We develop, manufacture and sell systems which are designed to reduce the cost of testing and to perform reliability screening, or burn-in, of complex logic devices, memory ICs, sensors and optical devices. These systems can be used to simultaneously perform parallel testing and burn-in of packaged integrated circuits, or ICs, singulated bare die or ICs still in wafer form. Increased quality and reliability needs of the Automotive, Mobility and flash memory integrated circuit markets are driving additional testing requirements, capacity needs and opportunities for Aehr Test products in package and wafer level testing. Leveraging its expertise as a long-time leading provider of burn-in equipment, with over 2,500 systems installed worldwide, the Company has developed and introduced several innovative product families, including the ABTSTM and FOXTM systems, the WaferPakTM cartridge and the DiePak® carrier. The latest ABTS family of packaged part burn-in and test systems can perform test during burn-in of complex devices, such as digital signal processors, microprocessors, microcontrollers and systems-on-a-chip, and offers individual temperature control for high-power advanced logic devices. The FOX systems are full wafer contact parallel test and burn-in systems designed to make contact with all pads of a wafer simultaneously, thus enabling full wafer parallel test and burn-in. They are also used for parallel test and burn-in singulated die or very small multi-IC modules. The WaferPak cartridge includes a full-wafer probe card for use in testing wafers in FOX systems. The DiePak carrier is a reusable, temporary package that enables IC manufacturers to perform cost-effective test and burn-in of singulated bare die or very small multi-IC modules. Semiconductor manufacturing is a complex, multi-step process, and defects or weaknesses that may result in the failure of an integrated circuit, or IC, may be introduced at any process step. Failures may occur immediately or at any time during the operating life of an IC, sometimes after several months of normal use. Semiconductor manufacturers rely on testing and reliability screening to identify and eliminate defects that occur during the manufacturing process. Testing and reliability screening involve multiple steps. The first set of tests is typically performed by IC manufacturers before the processed semiconductor wafer is cut into individual die, in order to avoid the cost of packaging defective die into their packages. This “wafer probe” testing can be performed on one or many die at a time, including testing the entire wafer at once. After the die are packaged and before they undergo reliability screening, a short test is typically performed to detect packaging defects. Most leading-edge microprocessors, microcontrollers, digital signal processors, memory ICs, sensors and optical devices (such as vertical-cavity surface-emitting lasers, or VCSELs) then undergo an extensive reliability screening and stress testing procedure known as “burn-in” or “cycling,” depending on the application. The burn-in process screens for early failures by operating the IC at elevated voltages and temperatures, up to 150 degrees Celsius (302 degrees Fahrenheit), for periods typically ranging from 2 to 48 hours. A typical burn-in system can process thousands of ICs simultaneously. After burn-in, the ICs undergo a final test process using automatic test equipment, or testers. The cycling process screens flash memory devices for failure to meet write/erase cycling endurance requirements. The Company manufactures and markets full wafer contact test systems, test during burn-in systems, test fixtures and related accessories. All of the Company’s systems are modular, allowing them to be configured with optional features to meet customer requirements. Systems can be configured for use in production applications, where capacity, throughput and price are most important, or for reliability engineering and quality assurance applications, where performance and flexibility, such as extended temperature ranges, are essential. The FOX-XP test and burn-in system, introduced in July 2016, is designed for devices in wafer, singulated die, and module form that require test and burn-in times typically measured in hours. The FOX-XP system can test and burn in up to 18 wafers at a time. For high reliability applications, such as automotive, mobile devices, sensors, and SSDs, the FOX-XP system is a cost-effective solution for producing tested and burned-in die for use in multi-chip packages. Using Known-Good Die, or KGD, which are fully burned-in and tested die, in multi-chip packages helps assure the reliability of the final product and lowers costs by increasing the yield of high-cost multi-chip packages. Wafer-level burn-in and test enables lower cost production of KGD for multi-chip modules, 3-D stacked packages and systems-in-a-package. The FOX-XP system has been extended for burn-in and test of small multi-die modules by using DiePak carriers. The DiePak carrier with its multi-module sockets and high wattage dissipation capabilities has a capacity of hundreds of modules, much higher than the capacity of a traditional burn-in system with traditional single-die sockets and heat sinks. This capability was introduced in March 2017. The FOX-15 full wafer parallel test system, the predecessor to the FOX-XP system, was introduced in October 2007 and was designed for full-wafer test and burn-in. The FOX-15 system is nearing the end of its lifecycle and limited shipments are expected in the future. The FOX-1P full wafer parallel test system, introduced in October 2014, is designed for massively parallel test of devices at wafer level. The FOX-1P system is designed to make electrical contact to and test all of the die on a wafer in a single touchdown. The FOX-1P test head and WaferPak contactor are compatible with industry-standard 300 mm wafer probers which provide the wafer handling and alignment automation for the FOX-1P system. The FOX-1P pattern generator is designed to functionally test industry-standard memory devices such as flash and DRAMs, plus it is optimized to test memory or logic ICs that incorporate design for testability, or DFT, and built-in self-test, or BIST. The FOX-1P universal per-pin architecture to provide per-pin electronics and per-device power supplies is tailored to full-wafer functional test. The Company believes that the FOX-1P system can significantly reduce the cost of testing IC wafers. The Company’s FOX-1P system was partially funded through a development agreement with a leading semiconductor manufacturer. The Company received the first production order of this new system and shipped the first system in July 2016. One of the key components of the FOX systems is the patented WaferPak cartridge system. The WaferPak cartridge contains a full-wafer single-touchdown probe card which is easily removable from the system. Traditional probe cards contact only a portion of the wafer, requiring multiple touchdowns to test the entire wafer. The unique design is intended to accommodate a wide range of contactor technologies so that the contactor technology can evolve along with the changing requirements of the customer’s wafers. The WaferPak cartridges are custom designed for each device type, each of which has a typical lifetime of 2 to 7 years, depending on the device life cycle. Therefore, multiple sets of WaferPak cartridges could be purchased over the life of a FOX system. A key new component of the FOX-XP systems is the patent-pending DiePak carrier system. The DiePak carrier contains many multi-module sockets with very fine-pitch probes which are easily removable from the system. Traditional sockets contact only a single device, requiring multiple large numbers of sockets and burn-in boards to test a production lot of devices. The unique design is intended to accommodate a wide range of socket sizes and densities so that the DiePak carrier technology can evolve along with the changing requirements of the customer’s devices. The DiePak carriers are custom designed for each device type, each of which has a typical lifetime of 2 to 7 years, depending on the device life cycle. Therefore, multiple sets of DiePak carriers could be purchased over the life of a FOX-XP system. Another key component of our FOX-XP and FOX-15 test cell is the WaferPak Aligner. The WaferPak Aligner performs automatic alignment of the customer’s wafer to the WaferPak cartridge so that the wafer can be tested and burned-in by the FOX-XP and FOX-15 systems. Typically one WaferPak Aligner can support several FOX-XP or FOX-15 systems. Similar to the WaferPak Aligner for WaferPak cartridges, Aehr Test offers a DiePak Loader for DiePak carriers. The DiePak Loader performs automatic loading of the customer’s modules to the DiePak carrier so that the modules can be tested and burned-in by the FOX-XP system. Typically one DiePak Loader can support several FOX-XP systems. The full wafer contact systems product category accounted for approximately 44%, 51% and 60% of the Company’s net sales in fiscal 2018, 2017 and 2016, respectively. Test during burn-in, or TDBI, systems consist of several subsystems: pattern generation and test electronics, control software, network interface and environmental chamber. The test pattern generator allows duplication of most of the functional tests performed by a traditional tester. Pin electronics at each burn-in board, or BIB, position are designed to provide accurate signals to the ICs being tested and detect whether a device is failing the test. Devices being tested are placed on BIBs and loaded into environmental chambers which typically operate at temperatures from 25 degrees Celsius (77 degrees Fahrenheit) up to 150 degrees Celsius (302 degrees Fahrenheit) (optional chambers can produce temperatures as low as -55 degrees Celsius (-67 degrees Fahrenheit)). A single BIB can hold up to several hundred ICs, and a production chamber holds up to 72 BIBs, resulting in thousands of memory or logic devices being tested in a single system. The Advanced Burn-in and Test System, or ABTS, was introduced in fiscal 2008. The ABTS family of products is based on a hardware and software architecture that is intended to address not only today’s devices, but also future devices for many years to come. The ABTS system can test and burn-in both high-power logic and low-power ICs. It can be configured to provide individual device temperature control for devices up to 70W or more and with up to 320 I/O channels. The MAX system family, the predecessor to the ABTS family, was designed for monitored burn-in of memory and logic devices. The MAX system is nearing the end of its lifecycle and limited shipments are expected in the future. This packaged part systems product category accounted for approximately 56%, 49% and 40% of the Company’s net sales in fiscal 2018, 2017 and 2016, respectively. The Company sells, and licenses others to manufacture and sell, custom-designed test fixtures for its systems. The test fixtures include BIBs for the ABTS parallel test and burn-in system and for the MAX monitored burn-in system. These test fixtures hold the devices undergoing test or burn-in and electrically connect the devices under test to the system electronics. The capacity of each test fixture depends on the type of device being tested or burned-in, ranging from several hundred in memory production to as few as eight for high pin-count complex Application Specific Integrated Circuits, or ASICs, or microprocessor devices. Test fixtures are sold both with new Aehr Test systems and for use with the Company’s installed base of systems. Test fixtures are also available from third-party suppliers. The Company has received patents or applied for patents on certain features of the FOX, ABTS and MAX4 test fixtures. The Company has licensed or authorized several other companies to provide MAX4 BIBs from which the Company receives royalties. Royalties and revenue for the test fixtures product category accounted for less than 1% of net sales in fiscal 2018, 2017 and 2016. The Company markets and sells its products throughout the world to semiconductor manufacturers, semiconductor contract assemblers, electronics manufacturers and burn-in and test service companies. Sales to the Company’s five largest customers accounted for approximately 86%, 93%, and 94% of its net sales in fiscal 2018, 2017 and 2016, respectively. During fiscal 2018, Texas Instruments Incorporated, or Texas Instruments, STMicroelectronics, Inc., and Astronics Test Systems, Inc., accounted for approximately 34%, 26% and 13%, respectively, of the Company’s net sales. During fiscal 2017, Texas Instruments Incorporated, or Texas Instruments, STMicroelectronics, Inc., Intel Corporation and Cypress Semiconductor, accounted for approximately 45%, 19%, 17% and 10%, respectively, of the Company’s net sales. During fiscal 2016, Apple Inc. and Texas Instruments accounted for approximately 47% and 32%, respectively, of the Company’s net sales. No other customers accounted for more than 10% of the Company’s net sales for any of these periods. The Company expects that sales of its products to a limited number of customers will continue to account for a high percentage of net sales for the foreseeable future. In addition, sales to particular customers may fluctuate significantly from quarter to quarter. Such fluctuations may result in changes in utilization of the Company’s facilities and resources. The loss of or reduction or delay in orders from a significant customer or a delay in collecting or failure to collect accounts receivable from a significant customer could materially and adversely affect the Company’s business, financial condition and operating results. The Company has sales and service operations in the United States, Japan, Germany and Taiwan, dedicated service resources in China, South Korea, and the Philippines, and has established a network of distributors and sales representatives in certain key parts of the world. See “REVENUE RECOGNITION” in Item 7 under “Management’s Discussion and Analysis of Financial Condition and Results of Operations” for a further discussion of the Company’s relationship with distributors, and its effects on revenue recognition. The Company’s customer service and support program includes system installation, system repair, applications engineering support, spare parts inventories, customer training and documentation. The Company has applications engineering and field service personnel located near and sometimes co-located at our customers and includes resources at the corporate headquarters in Fremont, California, at customer locations in Texas, at the Company’s subsidiaries in Japan and Germany, at its branch office in Taiwan, and also through 3rd party agreements in China, South Korea, and the Philippines. The Company’s distributors provide applications and field service support in other parts of the world. The Company customarily provides a warranty on its products. The Company offers service contracts on its systems directly and through its subsidiaries, distributors and representatives. The Company maintains customer support personnel in the Philippines, China and South Korea. The Company believes that maintaining a close relationship with customers and providing them with ongoing engineering support improves customer satisfaction and will provide the Company with a competitive advantage in selling its products to the Company’s customers. At May 31, 2018, the Company’s backlog was $8.4 million compared with $12.7 million at May 31, 2017. The Company’s backlog consists of product orders for which confirmed purchase orders have been received and which are scheduled for shipment within 12 months. Due to the possibility of customer changes in delivery schedules or cancellations and potential delays in product shipments or development projects, the Company’s backlog as of a particular date may not be indicative of net sales for any succeeding period. The Company historically has devoted a significant portion of its financial resources to research and development programs and expects to continue to allocate significant resources to these efforts. Certain research and development expenditures related to non-recurring engineering milestones have been transferred to cost of goods sold, reducing research and development expenses. The Company’s research and development expenses during fiscal 2018, 2017 and 2016 were $4.2 million, $4.7 million and $4.3 million, respectively. The Company conducts ongoing research and development to design new products and to support and enhance existing product lines. Building upon the expertise gained in the development of its existing products, the Company has developed the FOX family of systems for performing test and burn-in of entire processed wafers, rather than individual die or packaged parts. The Company has extended the FOX-XP product to also perform test and burn-in of devices in singulated die and module form. The Company is developing enhancements to the ABTS and FOX families of products, intended to improve the capability and performance for testing and burn-in of future generation ICs and provide the flexibility in a wide variety of applications. The Company assembles its products from components and parts manufactured by others, including environmental chambers, power supplies, metal fabrications, printed circuit assemblies, ICs, burn-in sockets, high-density interconnects, wafer contactors and interconnect substrates. Final assembly and testing are performed within the Company’s facilities. The Company’s strategy is to use in-house manufacturing only when necessary to protect a proprietary process or when a significant improvement in quality, cost or lead time can be achieved and relies on subcontractors to manufacture many of the components and subassemblies used in its products. The Company’s principal manufacturing facility is located in Fremont, California. The Company’s facility in Utting, Germany provides limited manufacturing and product customization. The semiconductor equipment industry is intensely competitive. Significant competitive factors in the semiconductor equipment market include price, technical capabilities, quality, flexibility, automation, cost of ownership, reliability, throughput, product availability and customer service. In each of the markets it serves, the Company faces competition from established competitors and potential new entrants, many of which have greater financial, engineering, manufacturing and marketing resources than the Company. The Company’s FOX full wafer contact systems face competition from larger systems manufacturers that have significant technological know-how and manufacturing capability. Competing suppliers of full wafer contact systems include Advantest Corporation, Chroma ATE Inc., Teradyne Inc., Micronics Japan Co., Ltd., and Tokyo Electron Limited. The Company’s ABTS TDBI systems face increasingly severe competition, especially from several regional, low-cost manufacturers and from systems manufacturers that offer higher power dissipation per device under test. Some users of such systems, such as independent test labs, build their own burn-in systems, while others, particularly large IC manufacturers in Asia, acquire burn-in systems from captive or affiliated suppliers. The market for burn-in systems is highly fragmented, with many domestic and international suppliers. Competing suppliers of burn-in and functional test systems that compete with ABTS systems include Dong-Il Corporation, Micro Control Company, Incal Technology and Advantest Corporation. The Company’s WaferPak products are facing and are expected to face increasing competition. Several companies have developed or are developing full-wafer and single-touchdown probe cards. As the full-wafer test market develops, the Company expects that other competitors will emerge. The primary competitive factors in this market are cost, performance, reliability and assured supply. Competing suppliers of full-wafer probe cards include FormFactor, Inc., Japan Electronic Materials Corporation and Micronics Japan Co., Ltd. The Company’s test fixture products face numerous regional competitors. There are limited barriers to entry into the BIB market, and as a result, many companies design and manufacture BIBs, including BIBs for use with the Company’s ABTS and MAX systems. The Company has granted royalty-bearing licenses to several companies to make BIBs for use with the Company’s MAX4 systems and the Company may grant additional licenses as well. Sales of MAX4 BIBs by licensees result in royalties to the Company. The Company expects that its DiePak products for burning-in and testing multiple singulated die and small modules will face significant competition. The Company believes that several companies have developed or are developing products which are intended to enable test and burn-in of multiple bare die, and small modules. The Company expects that other competitors will emerge. The Company expects that the primary competitive factors in this market will be cost, performance, reliability and assured supply. Suppliers with products that compete with our single die DiePak products include Chroma ATE Inc. The Company expects its competitors to continue to improve the performance of their current products and to introduce new products with improved price and performance characteristics. New product introductions by the Company’s competitors or by new market entrants could cause a decline in sales or loss of market acceptance of the Company’s products. The Company has observed price competition in the systems market, particularly with respect to its less advanced products. Increased competitive pressure could also lead to intensified price-based competition, resulting in lower prices which could adversely affect the Company’s operating margins and results. The Company believes that to remain competitive it must invest significant financial resources in new product development and expand its customer service and support worldwide. There can be no assurance that the Company will be able to compete successfully in the future. The Company relies primarily on the technical and creative ability of its personnel, its proprietary software, and trade secrets and copyright protection, rather than on patents, to maintain its competitive position. The Company’s proprietary software is copyrighted and licensed to the Company’s customers. At May 31, 2018, the Company held fifty issued United States patents with expiration date ranges from 2018 to 2029 and had several additional United States patent applications and foreign patent applications pending. to the Company. Also, there can be no assurance that the Company will have the financial resources to defend its patents from infringement or claims of invalidity. There are currently no pending claims against the Company regarding infringement of any patents or other intellectual property rights of others. However, the Company may, from time to time, receive communications from third parties asserting intellectual property claims against the Company. Such claims could include assertions that the Company’s products infringe, or may infringe, the proprietary rights of third parties, requests for indemnification against such infringement or suggest the Company may be interested in acquiring a license from such third parties. There can be no assurance that any such claim made in the future will not result in litigation, which could involve significant expense to the Company, and, if the Company is required or deems it appropriate to obtain a license relating to one or more products or technologies, there can be no assurance that the Company would be able to do so on commercially reasonable terms, or at all. As of May 31, 2018, the Company, including its two foreign subsidiaries and one branch office, employed 86 persons collectively, on a full-time basis, of whom 21 were engaged in research, development and related engineering, 27 were engaged in manufacturing, 25 were engaged in marketing, sales and customer support and 13 were engaged in general administration and finance functions. In addition, the Company from time to time employs a number of contractors and part-time employees, particularly to perform customer support and manufacturing. The Company’s success is in part dependent on its ability to attract and retain highly skilled workers, who are in high demand. None of the Company’s employees are represented by a union and the Company has never experienced a work stoppage. The Company’s management considers its relations with its employees to be good. The Company’s common stock trades on the NASDAQ Capital Market under the symbol “AEHR.” The Company’s annual report on Form 10-K, quarterly reports on Form 10-Q, current reports on Form 8-K and amendments to these reports that are filed with the United States Securities and Exchange Commission, or SEC, pursuant to Section 13(a) or 15(d) of the Exchange Act, are available free of charge through the Company’s website at www.aehr.com as soon as reasonably practicable after we electronically file them with, or furnish them to the SEC. The public may read and copy any materials filed by the Company with the SEC at the SEC’s Public Reference Room at 100 F Street, NE, Washington, DC 20549. The public may obtain information on the operations of the Public Reference Room by calling the SEC at 1-800-SEC-0330. The SEC maintains an Internet site, www.sec.gov, that contains reports, proxy and information statements and other information regarding issuers that file electronically with the SEC. In addition, information regarding the Company’s code of conduct and ethics and the charters of its Audit, Compensation and Nominating and Governance Committees, are available free of charge on the Company’s website listed above. You should carefully consider the risks described below. These risks are not the only risks that we may face. Additional risks and uncertainties that we are unaware of, or that we currently deem immaterial, also may become important factors that affect us. If any of the following risks occur, our business, financial condition or results of operations could be materially and adversely affected which could cause our actual operating results to differ materially from those indicated or suggested by forward-looking statements made in this Annual Report on Form 10-K or presented elsewhere by management from time to time. We generate a large portion of our sales from a small number of customers. If we were to lose one or more of our large customers, operating results could suffer dramatically. The semiconductor manufacturing industry is highly concentrated, with a relatively small number of large semiconductor manufacturers and contract assemblers accounting for a substantial portion of the purchases of semiconductor equipment. Sales to our five largest customers accounted for approximately 86%, 93%, and 94% of our net sales in fiscal 2018, 2017 and 2016, respectively. During fiscal 2018, Texas Instruments, STMicroelectronics, Inc., and Astronics Test Systems, Inc., accounted for approximately 34%, 26% and 13%, respectively, of the Company’s net sales. During fiscal 2017, Texas Instruments, STMicroelectronics, Inc., Intel, and Cypress Semiconductor, accounted for approximately 45%, 19%, 17% and 10%, respectively, of the Company’s net sales. During fiscal 2016, Apple and Texas Instruments accounted for approximately 47% and 32%, respectively, of our net sales. No other customers accounted for more than 10% of our net sales for any of these periods. We expect that sales of our products to a limited number of customers will continue to account for a high percentage of net sales for the foreseeable future. In addition, sales to particular customers may fluctuate significantly from quarter to quarter. The loss of, reduction or delay in an order, or orders from a significant customer, or a delay in collecting or failure to collect accounts receivable from a significant customer could adversely affect our business, financial condition and operating results. The semiconductor equipment industry is intensely competitive. In each of the markets we serve, we face competition from established competitors and potential new entrants, many of which have greater financial, engineering, manufacturing and marketing resources than us. Our FOX wafer level and singulated die/module test and burn in systems face competition from larger systems manufacturers that have significant technological know-how and manufacturing capability. Our ABTS Test During Burn-in (TDBI) systems have faced and are expected to continue to face increasingly severe competition, especially from several regional, low-cost manufacturers and from systems manufacturers that offer higher power dissipation per device under test. Some users of such systems, such as independent test labs, build their own burn-in systems, while others, particularly large IC manufacturers in Asia, acquire burn-in systems from captive or affiliated suppliers. Our WaferPak products are facing and are expected to face increasing competition. Several companies have developed or are developing full-wafer and single-touchdown probe cards. We expect our competitors to continue to improve the performance of their current products and to introduce new products with improved price and performance characteristics. New product introductions by our competitors or by new market entrants could cause a decline in sales or loss of market acceptance of our products. We have observed price competition in the systems market, particularly with respect to its less advanced products. Increased competitive pressure could also lead to intensified price-based competition, resulting in lower prices which could adversely affect our operating margins and results. We believe that to remain competitive we must invest significant financial resources in new product development and expand our customer service and support worldwide. There can be no assurance that we will be able to compete successfully in the future. We rely on increasing market acceptance for our FOX system, and we may not be successful in attracting new customers or maintaining our existing customers. A principal element of our business strategy is to increase our presence in the test equipment market through system sales in our FOX wafer-level and singulated die/module test and burn-in product family. The market for the FOX systems is in the early stages of development. Market acceptance of the FOX system is subject to a number of risks. Before a customer will incorporate the FOX system into a production line, lengthy qualification and correlation tests must be performed. We anticipate that potential customers may be reluctant to change their procedures in order to transfer burn-in and test functions to the FOX system. Initial purchases are expected to be limited to systems used for these qualifications and for engineering studies. Market acceptance of the FOX system also may be affected by a reluctance of IC manufacturers to rely on relatively small suppliers such as us. As is common with new complex products incorporating leading-edge technologies, we may encounter reliability, design and manufacturing issues as we begin volume production and initial installations of FOX systems at customer sites. The failure of the FOX system to achieve increased market acceptance would have a material adverse effect on our future operating results, long-term prospects and our stock price. We rely on continued market acceptance of our ABTS system and our ability to complete certain enhancements. Continued market acceptance of the ABTS family is subject to a number of risks. It is important that we achieve customer acceptance, customer satisfaction and increased market acceptance as we add new features and enhancements to the ABTS product. To date, we have shipped ABTS systems to customers worldwide for use in both reliability and production applications. We have had a strengthening of ABTS product sales last two fiscal years. However, the failure of the ABTS family to grow revenues above current levels would have a material adverse effect on our future operating results. A substantial portion of our net sales is generated by relatively small volume, high value transactions. We derive a substantial portion of our net sales from the sale of a relatively small number of systems which typically range in purchase price from approximately $300,000 to well over $1 million per system. As a result, the loss or deferral of a limited number of system sales could have a material adverse effect on our net sales and operating results in a particular period. Most customer purchase orders are subject to cancellation or rescheduling by the customer with limited penalties, and, therefore, backlog at any particular date is not necessarily indicative of actual sales for any succeeding period. From time to time, cancellations and rescheduling of customer orders have occurred, and delays by our suppliers in providing components or subassemblies to us have caused delays in our shipments of our own products. There can be no assurance that we will not be materially adversely affected by future cancellations or rescheduling. For non-standard products where we have not effectively demonstrated the ability to meet specifications in the customer environment, we defer revenue until we have met such customer specifications. Any delay in meeting customer specifications could have a material adverse effect on our operating results. A substantial portion of net sales typically are realized near the end of each quarter. A delay or reduction in shipments near the end of a particular quarter, due, for example, to unanticipated shipment rescheduling, cancellations or deferrals by customers, customer credit issues, unexpected manufacturing difficulties experienced by us or delays in deliveries by suppliers, could cause net sales in a particular quarter to fall significantly below our expectations. We may experience increased costs associated with new product introductions. As is common with new complex products incorporating leading-edge technologies, we have encountered reliability, design and manufacturing issues as we began volume production and initial installations of certain products at customer sites. Some of these issues in the past have been related to components and subsystems supplied to us by third parties who have in some cases limited the ability of us to address such issues promptly. This process in the past required and in the future is likely to require us to incur un-reimbursed engineering expenses and to experience larger than anticipated warranty claims which could result in product returns. In the early stages of product development there can be no assurance that we will discover any reliability, design and manufacturing issues or, that if such issues arise, that they can be resolved to the customers’ satisfaction or that the resolution of such problems will not cause us to incur significant development costs or warranty expenses or to lose significant sales opportunities. We sell our products and services worldwide, and our business is subject to risks inherent in conducting business activities in geographic regions outside of the United States. Approximately 71%, 59%, and 80% of our net sales for fiscal 2018, 2017 and 2016, respectively, were attributable to sales to customers for delivery outside of the United States. We operate a direct sales, service and limited manufacturing organization in Germany and sales and service organizations in Japan and Taiwan as well as direct support through 3rd party agreements in China, South Korea, and the Philippines. We expect that sales of products for delivery outside of the United States will continue to represent a substantial portion of our future net sales. Our future performance will depend, in significant part, upon our ability to continue to compete in foreign markets which in turn will depend, in part, upon a continuation of current trade relations between the United States and foreign countries in which semiconductor manufacturers or assemblers have operations. A change toward more protectionist trade legislation in either the United States or such foreign countries, such as a change in the current tariff structures, export compliance or other trade policies, could adversely affect our ability to sell our products in foreign markets. In addition, we are subject to other risks associated with doing business internationally, including longer receivable collection periods and greater difficulty in accounts receivable collection, the burden of complying with a variety of foreign laws, difficulty in staffing and managing global operations, risks of civil disturbance or other events which may limit or disrupt markets, international exchange restrictions, changing political conditions and monetary policies of foreign governments. Approximately 100%, 0% and 0% of our net sales for fiscal 2018 were denominated in U.S. Dollars, Euros and Japanese Yen, respectively. Although the percentages of net sales denominated in Euros and Japanese Yen were small in fiscal 2018, they have been larger in the past and could become significant again in the future. A large percentage of net sales to European customers are denominated in U.S. Dollars, but sales to many Japanese customers are denominated in Japanese Yen. Because a substantial portion of our net sales is from sales of products for delivery outside the United States, an increase in the value of the U.S. Dollar relative to foreign currencies would increase the cost of our products compared to products sold by local companies in such markets. In addition, since the price is determined at the time a purchase order is accepted, we are exposed to the risks of fluctuations in the U.S. Dollar exchange rate during the lengthy period from the date a purchase order is received until payment is made. This exchange rate risk is partially offset to the extent our foreign operations incur expenses in the local currency. To date, we have not invested in any instruments designed to hedge currency risks. Our operating results could be adversely affected by fluctuations in the value of the U.S. Dollar relative to other currencies. We purchase materials from suppliers worldwide, which subjects the Company to increased risk. We purchase components, sub-assemblies, and chambers from suppliers outside the United States. Increases in tariffs, additional taxes, or trade barriers may result in an increase in our manufacturing costs. A decrease in the value of the U.S. Dollar relative to foreign currencies would increase the cost of our materials. Should the Company increase its sales prices to recover the increase in costs, this could result in a decrease in the competitiveness of our products. In addition, we are subject to other risks associated with purchasing materials from suppliers worldwide. Government authorities may also implement protectionist policies or impose limitations on the transfer of intellectual property. This may limit our ability to obtain products from certain geographic regions and require us to identify and qualify new suppliers. The process of qualifying suppliers could be lengthy, and no assurance can be given that any additional sources would be available to us on a timely basis. Changes in trade relations, currency fluctuations, or protectionist policies could have a material adverse effect on our business, financial condition or results of operations. The Company is exposed to cybersecurity threats or incidents. We collect, maintain, and transmit data on information systems. These systems include those owned and maintained by the Company or by third parties. In addition, we use cloud-based enterprise resource planning, ERP, software to manage the business integrating all facets of operations, including manufacturing, finance, and sales and marketing. The data maintained on these systems includes confidential and proprietary information belonging to Aehr, our customers, suppliers, and others. While the Company devotes significant resources to protect its systems and data from unauthorized access or misuse, we are exposed to cybersecurity risks. Our systems are subject to computer viruses, data breach, phishing schemes, and other malicious software programs or attacks. We have experienced cyber threats and incidents in the past. Although past threats and incidents have not resulted in a material adverse effect, cybersecurity incidents may result in business disruption, loss of data, or unauthorized access to intellectual property which could adversely affect our business. Our industry is subject to rapid technological change and our ability to remain competitive depends on our ability to introduce new products in a timely manner. The semiconductor equipment industry is subject to rapid technological change and new product introductions and enhancements. Our ability to remain competitive depends in part upon our ability to develop new products and to introduce them at competitive prices and on a timely and cost-effective basis. Our success in developing new and enhanced products depends upon a variety of factors, including product selection, timely and efficient completion of product design, timely and efficient implementation of manufacturing and assembly processes, product performance in the field and effective sales and marketing. Because new product development commitments must be made well in advance of sales, new product decisions must anticipate both future demand and the technology that will be available to supply that demand. Furthermore, introductions of new and complex products typically involve a period in which design, engineering and reliability issues are identified and addressed by our suppliers and by us. There can be no assurance that we will be successful in selecting, developing, manufacturing and marketing new products that satisfy market demand. Any such failure would materially and adversely affect our business, financial condition and results of operations. Because of the complexity of our products, significant delays can occur between a product’s introduction and the commencement of the volume production of such product. We have experienced, from time to time, significant delays in the introduction of, and technical and manufacturing difficulties with, certain of our products and may experience delays and technical and manufacturing difficulties in future introductions or volume production of our new products. Our inability to complete new product development, or to manufacture and ship products in time to meet customer requirements would materially adversely affect our business, financial condition and results of operations. Our dependence on subcontractors and sole source suppliers may prevent us from delivering our products on a timely basis and expose us to intellectual property infringement. We rely on subcontractors to manufacture many of the components or subassemblies used in our products. Our FOX and ABTS systems, WaferPak contactors and DiePak carriers contain several components, including environmental chambers, power supplies, high-density interconnects, wafer contactors, module contactors, signal distribution substrates, WaferPak Aligners, DiePak Loaders and certain ICs that are currently supplied by only one or a limited number of suppliers. Our reliance on subcontractors and single source suppliers involves a number of significant risks, including the loss of control over the manufacturing process, the potential absence of adequate capacity and reduced control over delivery schedules, manufacturing yields, quality and costs. In the event that any significant subcontractor or single source supplier is unable or unwilling to continue to manufacture subassemblies, components or parts in required volumes, we would have to identify and qualify acceptable replacements. The process of qualifying subcontractors and suppliers could be lengthy, and no assurance can be given that any additional sources would be available to us on a timely basis. Any delay, interruption or termination of a supplier relationship could adversely affect our ability to deliver products, which would harm our operating results. Our suppliers manufacture components, tooling, and provide engineering services. During this process, our suppliers are allowed access to our intellectual property. While we maintain patents to protect from intellectual property infringement, there can be no assurance that technological information gained in the manufacture of our products will not be used to develop a new product, improve processes or techniques which compete against our products. Litigation may be necessary to enforce or determine the validity and scope of our proprietary rights, and there can be no assurance that our intellectual property rights, if challenged, will be upheld as valid. Periodic economic and semiconductor industry downturns could negatively affect our business, results of operations and financial condition. Periodic global economic and semiconductor industry downturns have negatively affected and could continue to negatively affect our business, results of operations, and financial condition. Financial turmoil in the banking system and financial markets has resulted, and may result in the future, in a tightening of the credit markets, disruption in the financial markets and global economy downturn. These events may contribute to significant slowdowns in the industry in which we operate. Difficulties in obtaining capital and deteriorating market conditions can pose the risk that some of our customers may not be able to obtain necessary financing on reasonable terms, which could result in lower sales. Customers with liquidity issues may lead to additional bad debt expense. Turmoil in the international financial markets has resulted, and may result in the future, in dramatic currency devaluations, stock market declines, restriction of available credit and general financial weakness. In addition, flash memory and other similar device prices have historically declined, and will likely do so again in the future. These developments may affect us in several ways. The market for semiconductors and semiconductor capital equipment has historically been cyclical, and we expect this to continue in the future. The uncertainty of the semiconductor market may cause some manufacturers in the future to further delay capital spending plans. Economic conditions may also affect the ability of our customers to meet their payment obligations, resulting in cancellations or deferrals of existing orders and limiting additional orders. In addition, some governments have subsidized portions of fabrication facility construction, and financial turmoil may reduce these governments’ willingness to continue such subsidies. Such developments could have a material adverse effect on our business, financial condition and results of operations. The current economic conditions and uncertainty about future economic conditions make it challenging for us to forecast our operating results, make business decisions, and identify the risks that may affect our business, financial condition and results of operations. If such conditions recur, and we are not able to timely and appropriately adapt to changes resulting from the difficult macroeconomic environment, our business, financial condition or results of operations may be materially and adversely affected. Future changes in semiconductor technologies may make our products obsolete. Future improvements in semiconductor design and manufacturing technology may reduce or eliminate the need for our products. For example, improvements in semiconductor process technology and improvements in conventional test systems, such as reduced cost or increased throughput, may significantly reduce or eliminate the market for one or more of our products. If we are not able to improve our products or develop new products or technologies quickly enough to maintain a competitive position in our markets, our business may decline. If we are not able to reduce our operating expenses sufficiently during periods of weak revenue, or if we utilize significant amounts of cash to support operating losses, we may erode our cash resources and may not have sufficient cash to operate our business. In recent years, in the face of a downturn in our business and a decline in our net sales, we implemented a variety of cost controls and restructured our operations with the goal of reducing our operating costs to position ourselves to more effectively meet the needs of the then weak market for test and burn-in equipment. While we took significant steps to minimize our expense levels and to increase the likelihood that we would have sufficient cash to support operations during the downturn, from fiscal 2009 through fiscal 2017, with the exception of fiscal 2014, we experienced operating losses. We anticipate that our existing cash balance together with income from operations, collections of existing accounts receivable, revenue from our existing backlog of products, the sale of inventory on hand, and deposits and down payments against significant orders will be adequate to meet our working capital and capital equipment requirements. Depending on our rate of growth and profitability, and our ability to obtain significant orders with down payments, we may require additional equity or debt financing to meet our working capital requirements or capital equipment needs. There can be no assurance that additional financing will be available when required, or if available, that such financing can be obtained on terms satisfactory to us. Our stock price may fluctuate. The price of our common stock has fluctuated in the past and may fluctuate significantly in the future. We believe that factors such as announcements of developments related to our business, fluctuations in our operating results, general conditions in the semiconductor and semiconductor equipment industries as well as the worldwide economy, announcement of technological innovations, new systems or product enhancements by us or our competitors, fluctuations in the level of cooperative development funding, acquisitions, changes in governmental regulations, developments in patents or other intellectual property rights and changes in our relationships with customers and suppliers could cause the price of our common stock to fluctuate substantially. In addition, in recent years the stock market in general, and the market for small capitalization and high technology stocks in particular, have experienced extreme price fluctuations which have often been unrelated to the operating performance of the affected companies. Such fluctuations could adversely affect the market price of our common stock. We depend on our key personnel and our success depends on our ability to attract and retain talented employees. Our success depends to a significant extent upon the continued service of Gayn Erickson, our President and Chief Executive Officer, as well as other executive officers and key employees. We do not maintain key person life insurance for our benefit on any of our personnel, and none of our employees are subject to a non-competition agreement with us. The loss of the services of any of our executive officers or a group of key employees could have a material adverse effect on our business, financial condition and operating results. Our future success will depend in significant part upon our ability to attract and retain highly skilled technical, management, sales and marketing personnel. There is a limited number of personnel with the requisite skills to serve in these positions, and it has become increasingly difficult for us to hire such personnel. Competition for such personnel in the semiconductor equipment industry is intense, and there can be no assurance that we will be successful in attracting or retaining such personnel. Changes in management could disrupt our operations and adversely affect our operating results. We may be subject to litigation relating to intellectual property infringement which would be time-consuming, expensive and a distraction from our business. If we do not adequately protect our intellectual property, competitors may be able to use our proprietary information to erode our competitive advantage, which could harm our business and operating results. Litigation may be necessary to enforce or determine the validity and scope of our proprietary rights, and there can be no assurance that our intellectual property rights, if challenged, will be upheld as valid. Such litigation could result in substantial costs and diversion of resources and could have a material adverse effect on our operating results, regardless of the outcome of the litigation. In addition, there can be no assurance that any of the patents issued to us will not be challenged, invalidated or circumvented or that the rights granted thereunder will provide competitive advantages to us. There are no pending claims against us regarding infringement of any patents or other intellectual property rights of others. However, in the future we may receive communications from third parties asserting intellectual property claims against us. Such claims could include assertions that our products infringe, or may infringe, the proprietary rights of third parties, requests for indemnification against such infringement or suggestions that we may be interested in acquiring a license from such third parties. There can be no assurance that any such claim will not result in litigation, which could involve significant expense to us, and, if we are required or deem it appropriate to obtain a license relating to one or more products or technologies, there can be no assurance that we would be able to do so on commercially reasonable terms, or at all. While we believe we have complied with all applicable environmental laws, our failure to do so could adversely affect our business as a result of having to pay substantial amounts in damages or fees. Federal, state and local regulations impose various controls on the use, storage, discharge, handling, emission, generation, manufacture and disposal of toxic and other hazardous substances used in our operations. We believe that our activities conform in all material respects to current environmental and land use regulations applicable to our operations and our current facilities, and that we have obtained environmental permits necessary to conduct our business. Nevertheless, failure to comply with current or future regulations could result in substantial fines, suspension of production, alteration of our manufacturing processes or cessation of operations. Such regulations could require us to acquire expensive remediation equipment or to incur substantial expenses to comply with environmental regulations. Any failure to control the use, disposal or storage of or adequately restrict the discharge of, hazardous or toxic substances could subject us to significant liabilities. If we fail to maintain effective internal control over financial reporting in the future, the accuracy and timing of our financial reporting may be adversely affected. We are required to comply with Section 404 of the Sarbanes-Oxley Act of 2002. The provisions of the act require, among other things, that we maintain effective internal control over financial reporting and disclosure controls and procedures. Preparing our financial statements involves a number of complex processes, many of which are done manually and are dependent upon individual data input or review. These processes include, but are not limited to, calculating revenue, deferred revenue and inventory costs. While we continue to automate our processes and enhance our review and put in place controls to reduce the likelihood for errors, we expect that for the foreseeable future, many of our processes will remain manually intensive and thus subject to human error. Our common stock may be delisted from The NASDAQ Capital Market if we cannot maintain compliance with NASDAQ’s continued listing requirements. In order to maintain our listing on The NASDAQ Capital Market, we are required to maintain compliance with NASDAQ’s continued listing requirements. The continued listing requirements include, among others, a minimum bid price of $1.00 per share and any of: (i) a minimum stockholders’ equity of $2.5 million; (ii) a market value of listed securities of at least $35 million; or (iii) net income from continuing operations of $500,000 in the most recently completed fiscal year or in two of the last three fiscal years. There are no assurances that we will be able to sustain long-term compliance with NASDAQ’s continued listing requirements. On April 19, 2016, we were notified by NASDAQ that we were no longer in compliance with NASDAQ’s continued listing requirements as we did not have a minimum stockholders’ equity of $2.5 million. On October 3, 2016, we were notified by NASDAQ that we had regained compliance with NASDAQ’s continued listing requirements. If we fail to maintain compliance with the applicable NASDAQ continued listing requirements, our stock may be delisted. If we are delisted, we would expect our common stock to be traded in the over-the-counter market, which could make trading our common stock more difficult for investors, potentially leading to declines in our share price and liquidity. Delisting from The NASDAQ Capital Market would also constitute an event of default under our convertible notes. In addition, delisting could result in negative publicity and make it more difficult for us to raise additional capital. The Company’s principal administrative and production facilities are located in Fremont, California, in a 51,289 square foot building. The Company’s lease was renewed in February 2018 and expires in July 2023. The Company’s facility in Japan is located in a 418 square foot office in Tokyo under a lease which expires in June 2019. The Company also maintains a 1,585 square foot warehouse in Yamanashi under a lease which expires in November 2019. The Company leases a 492 square foot sales and support office in Utting, Germany. The lease, which began February 1, 1992 and expires on January 31, 2020, contains an automatic twelve months renewal, at rates to be determined, if no notice is given prior to six months from expiry. The Company’s and its subsidiaries’ annual rental payments currently aggregate $587,000. The Company periodically evaluates its global operations and facilities to bring its capacity in line with demand and to provide cost efficient services for its customers. In prior years, through this process, the Company has moved from certain facilities that exceeded the capacity required to satisfy its needs. The Company believes that its existing facilities are adequate to meet its current and reasonably foreseeable requirements. The Company regularly evaluates its expected future facilities requirements and believes that alternate facilities would be available if needed. The Company’s common stock is publicly traded on the NASDAQ Capital Market under the symbol “AEHR”. The following table sets forth, for the periods indicated, the high and low sale prices for the common stock on such market. These quotations represent prices between dealers and do not include retail markups, markdowns or commissions and may not necessarily represent actual transactions. At August 3, 2018, the Company had 139 holders of record of its common stock. A substantially greater number of holders of the Company’s common stock are “street name” or beneficial holders whose shares are held by banks, brokers and other financial institutions. The Company has not paid cash dividends on its common stock or other securities. The Company currently anticipates that it will retain its future earnings, if any, for use in the expansion and operation of its business and does not anticipate paying any cash dividends on its common stock in the foreseeable future. The Company did not repurchase any of its common stock during the fiscal year ended May 31, 2018. The following graph shows a comparison of total shareholder return for holders of the Company's common stock for the last five fiscal years ended May 31, 2018, compared with the NASDAQ Composite Index and the Philadelphia Semiconductor Index. The graph assumes that $100 was invested in the Company's common stock, in the NASDAQ Composite Index and the Philadelphia Semiconductor Index on May 31, 2013, and that all dividends were reinvested. 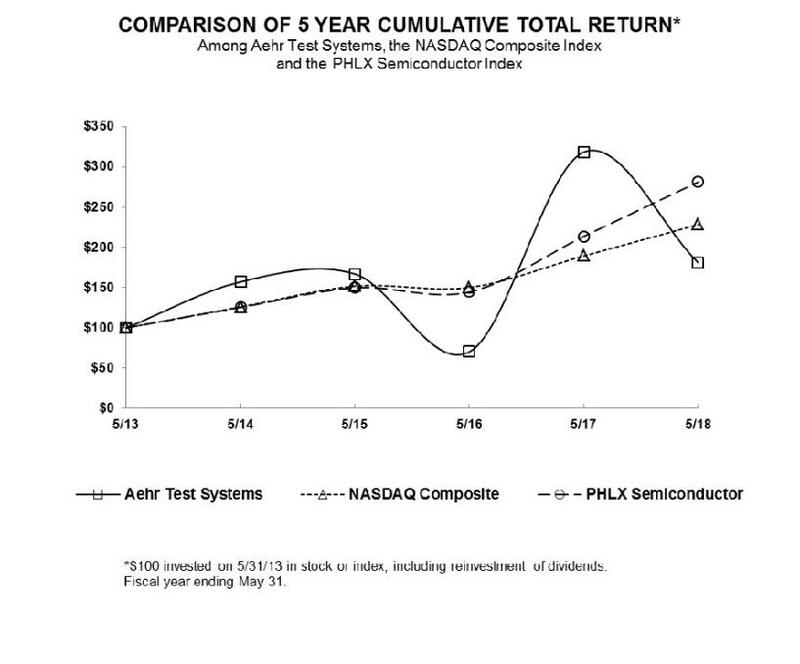 The Company believes that while total shareholder return can be an important indicator of corporate performance, the stock prices of semiconductor equipment companies like us are subject to a number of market-related factors other than company performance, such as competitive announcements, mergers and acquisitions in the industry, the general state of the economy and the performance of other semiconductor equipment company stocks. Stock prices and shareholder returns over the indicated period should not be considered indicative of future stock prices or shareholder returns. The selected consolidated financial data set forth below should be read in conjunction with “Management’s Discussion and Analysis of Financial Condition and Results of Operations” and the consolidated financial statements and related notes included elsewhere in this Annual Report on Form 10-K. The selected consolidated financial data in this section are not intended to replace the consolidated financial statements and are qualified in their entirety by the consolidated financial statements and related notes thereto included elsewhere in this Annual Report on Form 10-K.
We derived the statements of operations data for the years ended May 31, 2018, 2017 and 2016 and the balance sheet data as of May 31, 2018 and 2017 from our audited consolidated financial statements and related notes, which are included elsewhere in this Annual Report on Form 10-K. We derived the statements of operations data for the years ended May 31, 2015 and 2014 and the balance sheet data as of May 31, 2016, 2015 and 2014 from our audited consolidated financial statements and related notes which are not included in this Annual Report on Form 10-K. We have not declared or distributed any cash dividends. The following discussion and analysis of the financial condition and results of operations should be read in conjunction with our “Selected Consolidated Financial Data” and our consolidated financial statements and related notes included elsewhere in this Annual Report on Form 10-K.
We were founded in 1977 to develop and manufacture burn-in and test equipment for the semiconductor industry. Since our inception, we have over 2,500 systems installed at semiconductor manufacturers, semiconductor contract assemblers and burn-in and test service companies worldwide. Our principal products currently are the Advanced Burn-in and Test System, or ABTS, the FOX full wafer contact and singulated die/module parallel test and burn-in system, WaferPak Aligner, WaferPak contactors, DiePak Loader, the DiePak carriers and test fixtures. Our net sales consist primarily of sales of systems, WaferPak Aligners and DiePak Loaders, WaferPak contactors, DiePak carriers, test fixtures, upgrades and spare parts, revenues from service contracts, and engineering development charges. Our selling arrangements may include contractual customer acceptance provisions, which are mostly deemed perfunctory or inconsequential, and installation of the product occurs after shipment and transfer of title. Our discussion and analysis of our financial condition and results of operations are based upon our consolidated financial statements, which have been prepared in accordance with accounting principles generally accepted in the United States of America. The preparation of these consolidated financial statements requires us to make estimates and judgments that affect the reported amounts of assets, liabilities, revenues and expenses, and related disclosure of contingent assets and liabilities. On an ongoing basis, we evaluate our estimates, including those related to customer programs and incentives, product returns, bad debts, inventories, investments, income taxes, financing operations, warranty obligations and long-term service contracts, among others. Our estimates are derived from historical experience and on various other assumptions that are believed to be reasonable under the circumstances. Those results form the basis for making judgments about the carrying values of assets and liabilities that are not readily apparent from other sources. Actual results may differ from these estimates under different assumptions or conditions. We recognize revenue upon the shipment of products or the performance of services when: (1) persuasive evidence of the arrangement exists; (2) goods or services have been delivered; (3) the price is fixed or determinable; and (4) collectibility is reasonably assured. When a sales agreement involves multiple deliverables, such as extended support provisions, training to be supplied after delivery of the systems, and test programs specific to customers’ routine applications, the multiple deliverables are evaluated to determine the units of accounting. Judgment is required to properly identify the accounting units of multiple element transactions and the manner in which revenue is allocated among the accounting units. Judgments made, or changes to judgments made, may significantly affect the timing or amount of revenue recognition. Revenue related to the multiple elements is allocated to each unit of accounting using the relative selling price hierarchy. Consistent with accounting guidance, the selling price is based upon vendor specific objective evidence (VSOE). If VSOE is not available, third party evidence (TPE) is used to establish the selling price. In the absence of VSOE or TPE, estimated selling price is used. During the first quarter of fiscal 2013, we entered into an agreement with a customer to develop a next generation FOX system, and we shipped the first system in July 2016. The project identifies multiple milestones with values assigned to each. The consideration earned upon achieving the milestone is required to meet the following conditions prior to recognition: (i) the value is commensurate with the vendor’s performance to meet the milestone, (ii) it relates solely to past performance, (iii) and it is reasonable relative to all of the deliverables and payment terms within the arrangement. Revenue is recognized for the milestone upon acceptance by the customer. We recognize revenue in certain circumstances before physical delivery has occurred. In these arrangements, among other things, risk of ownership has passed to the customer, the customer has made a written fixed commitment to purchase the products, the customer has requested the products be held for future delivery as scheduled and designated by them, and no additional performance obligations exist by us. For these transactions, the products are segregated from inventory and normal billing and credit terms granted. Sales tax collected from customers is not included in net sales but rather recorded as a liability due to the respective taxing authorities. Provisions for the estimated future cost of warranty and installation are recorded at the time the products are shipped. Royalty-based revenue related to licensing income from performance test boards and burn-in boards is recognized upon the earlier of the receipt by us of the licensee’s report related to its usage of the licensed intellectual property or upon payment by the licensee. Our terms of sales with distributors are generally Free on Board, or FOB, shipping point with payment due within 60 days. All products go through in-house testing and verification of specifications before shipment. Apart from warranty reserves, credits issued have not been material as a percentage of net sales. Our distributors do not generally carry inventories of our products. Instead, the distributors place orders with us at or about the time they receive orders from their customers. Our shipment terms to our distributors do not provide for credits or rights of return. Because our distributors do not generally carry inventories of our products, they do not have rights to price protection or to return products. At the time we ship products to the distributors, the price is fixed. Subsequent to the issuance of the invoice, there are no discounts or special terms. We do not give the buyer the right to return the product or to receive future price concessions. Our arrangements do not include vendor consideration. We maintain an allowance for doubtful accounts to reserve for potentially uncollectible trade receivables. We also review our trade receivables by aging category to identify specific customers with known disputes or collection issues. We exercise judgment when determining the adequacy of these reserves as we evaluate historical bad debt trends, general economic conditions in the United States and internationally and changes in customer financial conditions. Uncollectible receivables are recorded as bad debt expense when all efforts to collect have been exhausted and recoveries are recognized when they are received. We provide and record the estimated cost of product warranties at the time revenues are recognized on products shipped. While we engage in extensive product quality programs and processes, including actively monitoring and evaluating the quality of our component suppliers, our warranty obligation is affected by product failure rates, material usage and service delivery costs incurred in correcting a product failure. Our estimate of warranty reserve is based on management’s assessment of future warranty obligations and on historical warranty obligations. Should actual product failure rates, material usage or service delivery costs differ from our estimates, revisions to the estimated warranty liability would be required, which could affect how we account for expenses. In each of the last three fiscal years, we have written down our inventory for estimated obsolescence or unmarketable inventory by an amount equal to the difference between the cost of inventory and the estimated market value based upon assumptions about future demand and market conditions. If future market conditions are less favorable than those projected by management, additional inventory write-downs may be required. Income taxes have been provided using the liability method whereby deferred tax assets and liabilities are determined based on differences between financial reporting and tax bases of assets and liabilities and net operating loss and tax credit carryforwards measured using the enacted tax rates and laws that will be in effect when the differences are expected to reverse or the carryforwards are utilized. Valuation allowances are established when it is determined that it is more likely than not that such assets will not be realized. A full valuation allowance was established against all deferred tax assets, as management determined that it is more likely than not that deferred tax assets will not be realized, as of May 31, 2018 and 2017. We account for uncertain tax positions consistent with authoritative guidance. The guidance prescribes a “more likely than not” recognition threshold and measurement attribute for the financial statement recognition and measurement of a tax position taken or expected to be taken in a tax return. We do not expect any material change in its unrecognized tax benefits over the next twelve months. We recognize interest and penalties related to unrecognized tax benefits as a component of income taxes. Although we file U.S. federal, various state and foreign tax returns, our only major tax jurisdictions are the United States, California, Germany and Japan. Tax years 1996 – 2017 remain subject to examination by the appropriate governmental agencies due to tax loss carryovers, research and development tax credits, or other tax attributes from those years. Stock-based compensation expense consists of expenses for stock options, restricted stock units, or RSUs, and employee stock purchase plan, or ESPP, purchase rights. Stock-based compensation cost for stock options and ESPP purchase rights is measured at each grant date, based on the fair value of the award using the Black-Scholes option valuation model, and is recognized as expense over the employee’s requisite service period. This model was developed for use in estimating the value of publicly traded options that have no vesting restrictions and are fully transferable. Our employee stock options have characteristics significantly different from those of publicly traded options. For RSUs, stock-based compensation cost is based on the fair value of our common stock at the grant date. All of our stock-based compensation is accounted for as an equity instrument. The fair value of each option grant and the right to purchase shares under our ESPP are estimated on the date of grant using the Black-Scholes option valuation model with assumptions concerning expected term, stock price volatility, expected dividend yield, risk-free interest rate and the expected life of the award. See Notes 10 to our consolidated financial statements for detailed information relating to stock-based compensation and the stock option plan and the ESPP. The following table sets forth statements of operations data as a percentage of net sales for the periods indicated. NET SALES. Net sales increased to $29.6 million for the fiscal year ended May 31, 2018 from $18.9 million for the fiscal year ended May 31, 2017, an increase of 56.4%. The increase in net sales in fiscal 2018 resulted primarily from increases in net sales of both our Test During Burn-in (TDBI) products and wafer-level products. Net sales of the TDBI products for fiscal 2018 were $16.5 million, and increased approximately $7.3 million from fiscal 2017. Net sales of the wafer-level products for fiscal 2018 were $13.1 million, and increased approximately $3.5 million from fiscal 2017. GROSS PROFIT. Gross profit increased to $12.4 million for the fiscal year ended May 31, 2018 from $6.8 million for the fiscal year ended May 31, 2017, an increase of 82.7%. Gross profit margin increased to 41.9% for the fiscal year ended May 31, 2018 from 35.9% for the fiscal year ended May 31, 2017. The increase in gross profit margin was primarily the result of manufacturing efficiencies due to an increase in net sales. SELLING, GENERAL AND ADMINISTRATIVE. SG&A expenses were $7.3 million for the fiscal year ended May 31, 2018, compared with $7.1 million for the fiscal year ended May 31, 2017, an increase of 3.4%. The increase in SG&A expenses was primarily due to increases in employment related expenses. RESEARCH AND DEVELOPMENT. R&D expenses decreased to $4.2 million for the fiscal year ended May 31, 2018 from $4.7 million for the fiscal year ended May 31, 2017, a decrease of 10.2%. The decrease in R&D expenses was primarily due to decreases in project expenses. INTEREST EXPENSE. Interest expense decreased to $399,000 for the fiscal year ended May 31, 2018 from $678,000 for the fiscal year ended May 31, 2017. The decrease in interest expense for the fiscal year ended May 31, 2018 was primarily due to the debt issuance costs related to the convertible notes becoming fully amortized at the end of fiscal 2017. OTHER EXPENSE, NET. Other expense, net was $61,000 and $21,000 for the fiscal year ended May 31, 2018 and 2017, respectively. The change in other expense was due primarily to losses realized in connection with the fluctuation in the value of the dollar compared to foreign currencies during the referenced periods. INCOME TAX BENEFIT (EXPENSE). Income tax benefit was $73,000 for the fiscal year ended May 31, 2018 compared with income tax expense of $25,000 for the fiscal year ended May 31, 2017. The income tax benefit in the fiscal year ended May 31, 2018 was primarily due to the impact of the “Tax Cuts and Jobs Act” enacted on December 22, 2017, specifically, the provision which made our alternative minimum tax credit refundable by 2022. NET SALES. Net sales increased to $18.9 million for the fiscal year ended May 31, 2017 from $14.5 million for the fiscal year ended May 31, 2016, an increase of 30.3%. The increase in net sales in fiscal 2017 resulted primarily from increases in net sales of both our wafer-level products and Test During Burn-in (TDBI) products. Net sales of the wafer-level products for fiscal 2017 were $9.6 million, and increased approximately $0.9 million from fiscal 2016. Net sales of the TDBI products for fiscal 2017 were $9.2 million, and increased approximately $3.4 million from fiscal 2016. GROSS PROFIT. Gross profit increased to $6.8 million for the fiscal year ended May 31, 2017 from $5.1 million for the fiscal year ended May 31, 2016, an increase of 31.8%. Gross profit margins for the fiscal years ended May 31, 2017 and 2016 were 35.9% and 35.5%, respectively. SELLING, GENERAL AND ADMINISTRATIVE. SG&A expenses were $7.1 million for the fiscal year ended May 31, 2017, compared with $7.0 million for the fiscal year ended May 31, 2016, an increase of 1.1%. The increase in SG&A expenses was primarily due to increases in employment related expenses. RESEARCH AND DEVELOPMENT. R&D expenses increased to $4.7 million for the fiscal year ended May 31, 2017 from $4.3 million for the fiscal year ended May 31, 2016, an increase of 7.7%. Higher R&D expenses in the fiscal year ended May 31, 2017 were primarily due to increases of $0.2 million in employment related expenses and $0.1 million in project expenses. INTEREST EXPENSE. Interest expense increased to $678,000 for the fiscal year ended May 31, 2017 from $605,000 for the fiscal year ended May 31, 2016. The increase in interest expense for the fiscal year ended May 31, 2017 was primarily due to higher average borrowings. OTHER (EXPENSE) INCOME, NET. Other expense, net was $21,000 and $16,000 for the fiscal year ended May 31, 2017 and 2016, respectively. The change in other expense was due primarily to losses realized in connection with the fluctuation in the value of the dollar compared to foreign currencies during the referenced periods. INCOME TAX EXPENSE. Income tax expense was $25,000 and $10,000 for the fiscal year ended May 31, 2017 and 2016, respectively. We consider cash and cash equivalents as liquid and available for use. As of May 31, 2018 and 2017, we had $16.8 million and $17.8 million, respectively, in cash and cash equivalents. Net cash used in operating activities was $1.4 million and $4.5 million for the fiscal years ended May 31, 2018 and 2017, respectively. For the fiscal year ended May 31, 2018, net cash used in operating activities was primarily the result of the net income of $0.5 million, as adjusted to exclude the effect of non-cash charge of stock-based compensation expense of $1.0 million, depreciation and amortization of $0.4 million, and a decrease in accounts receivable of $1.3 million. Other changes in cash from operations primarily resulted from an increase in inventories of $2.1 million, a decrease in customer deposits and deferred revenue of $1.5 million, as well as the decrease in accounts payable of $1.1 million. The decrease in accounts receivable was primarily due to improvements in customer payment terms. The increase in inventories is to support future shipments for customer orders. The decrease in customer deposits and deferred revenue was primarily due to the decrease in backlog of customer orders with down payments. The decrease in accounts payable was primarily due to the down payments applied toward vendor invoices. For the fiscal year ended May 31, 2017, net cash used in operating activities was primarily the result of the net loss of $5.7 million, as adjusted to exclude the effect of non-cash charge of stock-based compensation expense of $1.0 million, and an increase in accounts receivable of $3.5 million, partially offset by a decrease in inventories of $0.4 million. Other changes in cash from operations resulted from an increase in accounts payable as well as an increase in customer deposits and deferred revenue of $1.7 million each. The increase in accounts receivable was primarily due to an increase in sales. The decrease in inventories is primarily due to the sales of systems on-hand at the beginning of the period. The increase in accounts payable was primarily due to higher expenditures associated with higher revenue. The increase in customer deposits and deferred revenue was primarily due to the receipt of additional down payments from certain customers. Net cash used in investing activities was $0.6 million and $0.5 million for the fiscal year ended May 31, 2018 and 2017, respectively. Net cash used in investing activities for the fiscal year ended May 31, 2018 and 2017 was due to the purchases of property and equipment. Financing activities provided net cash of $0.9 million for the fiscal year ended May 31, 2018 as compared to $21.8 million for the fiscal year ended May 31, 2017. Net cash provided by financing activities during the fiscal year ended May 31, 2018 was primarily due to the proceeds from issuance of common stock under employee plans. Net cash provided by financing activities during the fiscal year ended May 31, 2017 was primarily due to the net proceeds of $15.8 million from the sale of our common stock in a public offering that closed on April 19, 2017, the net proceeds of $5.3 million from the sale of our common stock in a private placement transaction with certain institutional and accredited investors that closed on September 28, 2016, and $0.7 million in proceeds from issuance of common stock under employee plans. The effect of fluctuation in exchange rates increased cash by $43,000 and $1,000 for the fiscal year ended May 31, 2018 and 2017, respectively. The changes were due to the fluctuation in the value of the dollar compared to foreign currencies. As of May 31, 2018 and 2017, we had working capital of $18.3 million and $21.5 million, respectively. For the fiscal year ended May 31, 2016, net cash used in operating activities was primarily the result of the net loss of $6.8 million, as adjusted to exclude the effect of non-cash charges including stock-based compensation expense of $1.0 million, and depreciation and amortization of $0.2 million. Other changes in cash from operations resulted from a decrease in accounts receivable of $0.9 million, and increases in accounts payable of $0.6 million and accrued expenses of $0.5 million, offset by a decrease in customer deposits and deferred revenue of $2.9 million. The decrease in accounts receivable was primarily due to improvements in customer payment terms. The increases in accounts payable and accrued expenses were primarily due to higher expenditures associated with higher revenue. The decrease in customer deposits and deferred revenue was primarily due to the decrease in backlog of customer orders with down payments. Net cash used in investing activities was $0.9 million for the fiscal year ended May 31, 2016 was due to the purchase of property and equipment. Net cash provided by financing activities of $2.5 million during the fiscal year ended May 31, 2016 was due to net borrowings under the credit facility of $2.0 million, and $0.5 million in proceeds from issuance of common stock under employee plans. Refer to Note 8 of Notes to Consolidated Financial Statements, “LONG-TERM DEBT”, for further discussion of the Credit Facility. The effect of fluctuation in exchange rates increased cash by $106,000 for the fiscal year ended May 31, 2016 due to the fluctuation in the value of the dollar compared to foreign currencies. We lease our manufacturing and office space under operating leases. We entered into a non-cancelable operating lease agreement for our United States manufacturing and office facilities, which was renewed in February 2018 and expires in July 2023. Under the lease agreement, we are responsible for payments of utilities, taxes and insurance. From time to time, we evaluate potential acquisitions of businesses, products or technologies that complement our business. If consummated, any such transactions may use a portion of our working capital or require the issuance of equity. We have no present understandings, commitments or agreements with respect to any material acquisitions. We anticipate that the existing cash balance together with income from operations, collections of existing accounts receivable, revenue from our existing backlog of products, the sale of inventory on hand, and deposits and down payments against significant orders will be adequate to meet our liquidity requirements for the next 12 months. We have not entered into any off-balance sheet financing arrangements and have not established any special purpose or variable interest entities. The following table provides a summary of such arrangements, or contractual obligations. (2) Shown above are our binding purchase obligations. The large majority of our purchase orders are cancelable by either party, which if canceled may result in a negotiation with the vendor to determine if there shall be any restocking or cancellation fees payable to the vendor. In the normal course of business to facilitate sales of our products, we indemnify other parties, including customers, with respect to certain matters. We have agreed to hold the other party harmless against losses arising from a breach of representations or covenants, or from intellectual property infringement or other claims. These agreements may limit the time period within which an indemnification claim can be made and the amount of the claim. In addition, we have entered into indemnification agreements with our officers and directors, and our bylaws contain similar indemnification obligations to our agents. It is not possible to determine the maximum potential amount under these indemnification agreements due to the limited history of prior indemnification claims and the unique facts and circumstances involved in each particular agreement. To date, our payments under these agreements have not had a material impact on our operating results, financial position or cash flows. For a description of recent accounting pronouncements, including the expected dates of adoption and estimated effects, if any, on our consolidated financial statements, see Note 1, “Organization and Summary of Significant Accounting Policies,” of the Notes to Consolidated Financial Statements. We had no holdings of derivative financial or commodity instruments at May 31, 2018. We are exposed to financial market risks, including changes in interest rates and foreign currency exchange rates. We only invest our short-term excess cash in government-backed securities with maturities of 18 months or less. We do not use any financial instruments for speculative or trading purposes. Fluctuations in interest rates would not have a material effect on our financial position, results of operations or cash flows. A majority of our revenue and capital spending is transacted in U.S. Dollars. We, however, enter into transactions in other currencies, primarily Euros and Japanese Yen. Since the price is determined at the time a purchase order is accepted, we are exposed to the risks of fluctuations in the foreign currency-U.S. Dollar exchange rates during the lengthy period from purchase order to ultimate payment. This exchange rate risk is partially offset to the extent that our subsidiaries incur expenses payable in their local currency. To date, we have not invested in instruments designed to hedge currency risks. In addition, our subsidiaries typically carry debt or other obligations due to us that may be denominated in either their local currency or U.S. Dollars. Since our subsidiaries’ financial statements are based in their local currency and our condensed consolidated financial statements are based in U.S. Dollars, our subsidiaries and we recognize foreign exchange gains or losses in any period in which the value of the local currency rises or falls in relation to the U.S. Dollar. A 10% decrease in the value of the subsidiaries’ local currency as compared with the U.S. Dollar would not be expected to result in a significant change to our net income or loss. There have been no material changes in our risk exposure since the end of the last fiscal year, nor are any material changes to our risk exposure anticipated. Financial statement schedules not listed above are either omitted because they are not applicable or the required information is shown in the Consolidated Financial Statements or in the Notes thereto. We have audited the accompanying consolidated balance sheets of Aehr Test Systems and its subsidiaries (the “Company”) as of May 31, 2018 and 2017, the related consolidated statements of operations, comprehensive income (loss), shareholders’ equity, and cash flows for each of the three years in the period ended May 31, 2018, and the related notes (collectively referred to as the “consolidated financial statements”). In our opinion, the consolidated financial statements present fairly, in all material respects, the financial position of the Company as of May 31, 2018 and 2017, and the results of its operations and its cash flows for each of the three years in the period ended May 31, 2018, in conformity with accounting principles generally accepted in the United States of America. We conducted our audits in accordance with the standards of the PCAOB. Those standards require that we plan and perform the audit to obtain reasonable assurance about whether the consolidated financial statements are free of material misstatement, whether due to error or fraud. The Company is not required to have, nor were we engaged to perform, an audit of its internal control over financial reporting. As part of our audits, we are required to obtain an understanding of internal control over financial reporting but not for the purpose of expressing an opinion on the effectiveness of the Company’s internal control over financial reporting. Accordingly, we express no such opinion. Aehr Test Systems (the “Company”) was incorporated in California in May 1977 and primarily designs, engineers and manufactures test and burn-in equipment used in the semiconductor industry. The Company’s principal products are the Advanced Burn-In and Test System, or ABTS, the FOX full wafer contact parallel test and burn-in systems, the MAX burn-in system, WaferPak full wafer contactor, the DiePak carrier and test fixtures. Since inception, the Company has incurred substantial cumulative losses and negative cash flows from operations. In response, the Company took steps to minimize expense levels, entered into credit arrangements, and raised capital through public and private equity offerings, to increase the likelihood that it will have sufficient cash to support operations. In April 2017, the Company completed a public offering of its common stock raising net proceeds to the Company of $15.8 million. At May 31, 2018 the Company had $16.8 million in cash and cash equivalents. The Company anticipates that the existing cash balance together with income from operations, collections of existing accounts receivable, revenue from our existing backlog of products, the sale of inventory on hand, and deposits and down payments against significant orders will be adequate to meet its working capital and capital equipment requirements. The consolidated financial statements include the accounts of the Company and both its wholly-owned and majority-owned foreign subsidiaries. Intercompany accounts and transactions have been eliminated. Assets and liabilities of the Company’s foreign subsidiaries and a branch office are translated into U.S. Dollars from their functional currencies of Japanese Yen, Euros and New Taiwan Dollars using the exchange rate in effect at the balance sheet date. Additionally, their net sales and expenses are translated using exchange rates approximating average rates prevailing during the fiscal year. Translation adjustments that arise from translating their financial statements from their local currencies to U.S. Dollars are accumulated and reflected as a separate component of shareholders’ equity (deficit). Transaction gains and losses that arise from exchange rate changes denominated in currencies other than the local currency are included in the Consolidated Statements of Operations as incurred. See Note 12 for the detail of foreign exchange transaction gains and losses for all periods presented. The preparation of financial statements in conformity with accounting principles generally accepted in the United States of America requires management to make estimates and assumptions that affect the reported amounts of assets and liabilities, disclosure of contingent assets and liabilities at the date of the financial statements and the reported amounts of revenues and expenses during the reporting period. Actual results could differ from those estimates. Significant estimates in the Company’s consolidated financial statements include allowance for doubtful accounts, valuation of inventory at the lower of cost or market, and warranty reserves. Cash equivalents consist of money market instruments purchased with an original maturity of three months or less. These investments are reported at fair value. receivables by aging category to identify specific customers with known disputes or collection issues. The Company exercises judgment when determining the adequacy of these reserves as the Company evaluates historical bad debt trends, general economic conditions in the United States and internationally, and changes in customer financial conditions. Uncollectible receivables are recorded as bad debt expense when all efforts to collect have been exhausted and recoveries are recognized when they are received. No significant adjustments to the allowance for doubtful accounts were recorded during the years ended May 31, 2018, 2017 or 2016. The Company sells its products primarily to semiconductor manufacturers in North America, Asia, and Europe. As of May 31, 2018, approximately 45%, 0% and 55% of gross accounts receivable were from customers located in Asia, Europe and North America, respectively. As of May 31, 2017, approximately 55%, 0% and 45% of gross accounts receivable were from customers located in Asia, Europe and North America, respectively. Three customers accounted for 38%, 32% and 11% of gross accounts receivable as of May 31, 2018. Three customers accounted for 47%, 40% and 11% of gross accounts receivable as of May 31, 2017. Three customers accounted for 34%, 26% and 13% of net sales in fiscal 2018. Four customers accounted for 45%, 19%, 17% and 10% of net sales in fiscal 2017. The Company performs ongoing credit evaluations of its customers and generally does not require collateral. The Company uses letter of credit terms for some of its international customers. The Company’s cash and cash equivalents are generally deposited with major financial institutions in the United States, Japan, Germany and Taiwan. The Company invests its excess cash in money market funds and U.S. Treasury Securities. The money market funds bear the risk associated with each fund. The money market funds have variable interest rates. The Company has not experienced any material losses on its money market funds or short-term cash deposits. The Company relies on subcontractors to manufacture many of the components and subassemblies used in its products. Quality or performance failures of the Company’s products or changes in its manufacturers’ financial or business condition could disrupt the Company’s ability to supply quality products to its customers and thereby have a material and adverse effect on its business and operating results. Some of the components and technologies used in the Company’s products are purchased and licensed from a single source or a limited number of sources. The loss of any of these suppliers may cause the Company to incur additional transition costs, result in delays in the manufacturing and delivery of its products, or cause it to carry excess or obsolete inventory and could cause it to redesign its products. Inventories include material, labor and overhead, and are stated at the lower of cost (first-in, first-out method) or net realizable value. Net realizable value is the estimated selling prices in the ordinary course of business, less costs of completion, disposal and transportation. Provisions for excess, obsolete and unusable inventories are made after management’s evaluation of future demand and market conditions. The Company adjusts inventory balances to approximate the lower of its manufacturing costs or net realizable value. If actual future demand or market conditions become less favorable than those projected by management, additional inventory write-downs may be required, and would be reflected in cost of product revenue in the period the revision is made. applications, the multiple deliverables are evaluated to determine the unit of accounting. Judgment is required to properly identify the accounting units of multiple element transactions and the manner in which revenue is allocated among the accounting units. Judgments made, or changes to judgments made, may significantly affect the timing or amount of revenue recognition. During the first quarter of fiscal 2013, the Company entered into an agreement with a customer to develop a next generation system, and the Company shipped the first system in July 2016. The project identifies multiple milestones with values assigned to each. The consideration earned upon achieving the milestone is required to meet the following conditions prior to recognition: (i) the value is commensurate with the vendor’s performance to meet the milestone, (ii) it relates solely to past performance, (iii) and it is reasonable relative to all of the deliverables and payment terms within the arrangement. Revenue is recognized for the milestone upon acceptance by the customer. The Company recognizes revenue in certain circumstances before physical delivery has occurred. In these arrangements, among other things, risk of ownership has passed to the customer, the customer has made a written fixed commitment to purchase the products, the customer has requested the products be held for future delivery as scheduled and designated by them, and no additional performance obligations exist by the Company. For these transactions, the products are segregated from inventory and normal billing and credit terms granted. Royalty-based revenue related to licensing income from performance test boards and burn-in boards is recognized upon the earlier of the receipt by the Company of the licensee’s report related to its usage of the licensed intellectual property or upon payment by the licensee. The Company’s terms of sales with distributors are generally FOB shipping point with payment due within 60 days. All products go through in-house testing and verification of specifications before shipment. Apart from warranty reserves, credits issued have not been material as a percentage of net sales. The Company’s distributors do not generally carry inventories of the Company’s products. Instead, the distributors place orders with the Company at or about the time they receive orders from their customers. The Company’s shipment terms to our distributors do not provide for credits or rights of return. Because the Company’s distributors do not generally carry inventories of our products, they do not have rights to price protection or to return products. At the time the Company ships products to the distributors, the price is fixed. Subsequent to the issuance of the invoice, there are no discounts or special terms. The Company does not give the buyer the right to return the product or to receive future price concessions. The Company’s arrangements do not include vendor consideration. Costs incurred in the research and development of new products or systems are charged to operations as incurred. Costs incurred in the development of software programs for the Company’s products are charged to operations as incurred until technological feasibility of the software has been established. Generally, technological feasibility is established when the software module performs its primary functions described in its original specifications, contains features required for it to be usable in a production environment, is completely documented and the related hardware portion of the product is complete. After technological feasibility is established, any additional costs are capitalized. Capitalization of software costs ceases when the software is substantially complete and is ready for its intended use. Capitalized costs are amortized over the estimated life of the related software product using the greater of the units of sales or straight-line methods over ten years. No system software development costs were capitalized or amortized in fiscal 2018, 2017 and 2016. In the event that facts and circumstances indicate that the carrying value of assets may be impaired, an evaluation of recoverability would be performed. If an evaluation is required, the estimated future undiscounted cash flows associated with the asset would be compared to the asset’s carrying value to determine if a write-down is required. The Company expenses all advertising costs as incurred and the amounts were not material for all periods presented. Amounts billed to customers for shipping and handling of products are included in net sales. Costs incurred related to shipping and handling of products are included in cost of sales. The Company accounts for uncertain tax positions consistent with authoritative guidance. The guidance prescribes a “more likely than not” recognition threshold and measurement attribute for the financial statement recognition and measurement of a tax position taken or expected to be taken in a tax return. The Company does not expect any material change in its unrecognized tax benefits over the next twelve months. The Company recognizes interest and penalties related to unrecognized tax benefits as a component of income taxes. Although the Company files U.S. federal, various state, and foreign tax returns, the Company’s only major tax jurisdictions are the United States, California, Germany and Japan. Tax years 1996 – 2017 remain subject to examination by the appropriate governmental agencies due to tax loss carryovers, research and development tax credits, or other tax attributes from those years. Comprehensive income (loss) generally represents all changes in shareholders’ equity except those resulting from investments or contributions by shareholders. Unrealized gains and losses on foreign currency translation adjustments are included in the Company’s components of comprehensive income (loss), which are excluded from net income (loss). Comprehensive income (loss) is included in the statements of comprehensive income (loss). In July 2015, the Financial Accounting Standards Board (“FASB”) issued an accounting standard update that requires management to measure inventory at the lower of cost or net realizable value. Net realizable value is the estimated selling prices in the ordinary course of business, less reasonably predictable costs of completion, disposal, and transportation. The Company adopted this new standard in fiscal year 2018. The adoption of this guidance did not have a significant impact on the Company’s consolidated financial statements.